Running can definitely be a powerful tool in your weight loss or weight maintenance efforts, but you can't expect to lose weight or stay thin with running alone. Runners who stay thin know that they must also follow healthy eating and lifestyle habits. Many people assume that runners, especially long-distance runners, can eat whatever they want because they'll burn off the calories. But skinny runners know that running doesn't give them a license to eat whatever they want, whenever they want. Runners who stay thin watch their portion sizes. They stop eating before they get too full. They often take a doggie bag home when dining out, because typical restaurant portions are way too big. They make sure they eat slowly and pay attention to when they start to feel full. Get familiar with standard portion sizes. They may actually be smaller than you think. For example, three ounces of meat is about the size of a deck of cards. One serving size of pasta or rice is about the size of a tennis ball. eat slowly and eliminate distractions. You're more likely to overeat if you're not paying attention to what or how much you're eating. Don't eat in front of the TV or the computer. Chew slowly - you'll enjoy your food more and eat less. Try putting smaller amounts of food on your plate or using smaller plates. If you put more food in front of you, you'll eat it because it's there. Eat your fruits and veggies first. They're low in calories and they'll fill you up, so you'll be less tempted to eat more of the higher-calorie foods. For example, start your dinners with a salad and a low-calorie dressing. Dietary fibre is an essential part of any healthy diet. But it's especially useful to people trying to lose weight since fibre makes you feel fuller longer. High-fibre foods usually involve more chewing, so your body has time to recognize you're no longer hungry. In addition, high-fibre foods also tend to be less calorie-dense, so you get fewer calories for the same volume of food. Skinny runners get plenty of fibre in their diet by eating lots of fruits and vegetables and choosing whole grain foods. Sprinkle berries in your cereal or on your yogurt. Keep cleaned baby carrots, celery sticks, and other vegetables in your refrigerator so you can grab them when you want a quick snack. When making a sandwich, use whole-grain bread and lots of vegetable fixings -- lettuce, tomatoes, thinly-sliced cucumbers, and sprouts -- for added fibre and nutrition. Add kidney beans to canned soup or a green salad. Or make nachos with refried black beans, baked tortilla chips and salsa. Keep a bowl of fruit on your kitchen table or desk to encourage you to eat fruit rather than running to the pantry or vending machine. Runners who lose weight or maintain their weight make sure they run regularly -- at least 3 or 4 times a week. They don't let excuses get in the way of their running. They know that there may be times when their motivation is lacking, but they have plenty of motivation strategies to get them through the tough times. Skinny runners put themselves first and know that running is important to their physical and mental health, so they make sure running is always a part of their regular routine. Run in the morning. Morning runners are more consistent than those who run at other times of the day. When you run first thing in the morning, you won't have to worry about putting off your run because something else comes up during the day or you're too exhausted in the evening to run. Turn off the television. You can fit in a 30-minute run just by giving up one sitcom -- especially if it's a rerun. You'll definitely feel a lot better and you probably won't feel like you're missing out. Remind yourself of all the great benefits of running, such as improved physical and mental health, and all the reasons you started running. Run with buddies. The social aspect of running is one of the key reasons people start, and stick, with it. Find a local running club or recruit some friends to run with you. If you have kids and have little time to run, schedule your runs and get your spouse on board so you get help with some of the child-care responsibilities. And get creative and take advantage of opportunities to run. For example, if you're watching your kid's soccer game, run some laps around the field before or even during the game. Or, see if you can find a gym that offers baby-sitting so that you can run on the treadmill while someone is watching your kids. Think of the extra expense as an investment in your physical and mental health. Skinny runners know that it's better to eat several small meals and snacks throughout the day than to eat a huge breakfast, lunch, and dinner. Eating every three to four hours helps stabilize your blood sugar and prevents you from binging in between meals and overeating when you sit down for a meal. Eating mini meals also helps maintain your energy levels throughout the day, so you're more likely to have more energy for exercise. Keep healthy foods in your purse, briefcase, or desk. Dried fruit and nuts, oatmeal or low-fat granola bars are easy to stash and are perfect pick-me-ups when mid-morning hunger strikes. Healthy snacking doesn't mean you have to completely deny yourself. To satisfy your sweet tooth, have some fat-free pudding, frozen yogurt or frozen fruit bars. If you have a tendency to overeat when it comes to snacks, keep a convenient supply of snack-sized items. There are lots of 100-calorie snack packs of pretzels, cookies, and crackers available on your supermarket shelves. Use them to satisfy your mid-morning or mid-afternoon munchies. Many people skip breakfast because they don't have time, they don't like traditional breakfast foods, or they think it will help with their weight loss efforts. But if you wait until lunch to eat, your body assumes you're fasting and responds by slowing your metabolism. Skinny runners know that skipping breakfast doesn't help you lose weight. In fact, it will just make you hungrier, which increases your temptation to eat everything in sight. A nutritious breakfast gets you fuelled for the day and helps prevent you from binging later in the day. Runners who stay thin also know that they have a greater chance of burning off breakfast calories since they're consuming them early in the day. They also realize that a proper breakfast will help them burn more calories during a run because they'll be properly fuelled and have a more effective run. Scoop 1/2 cup low-fat cottage cheese into a cantaloupe or honeydew half. Fix a quick breakfast smoothie. Blend 1/2 cup each of plain low-fat yogurt and orange juice with 1/2 banana and some frozen berries. Top a bagel with non-fat cream cheese and thin apple or pear slices. Spread a thin layer of peanut butter on toast, bagels, or English muffins. Top with banana slices. Yogurt is the perfect on-the-go breakfast. Top with granola or chopped nuts for added crunch and nutrition. Many people overeat or eat the wrong kinds of foods when they're bored, stressed, or want to reward themselves. 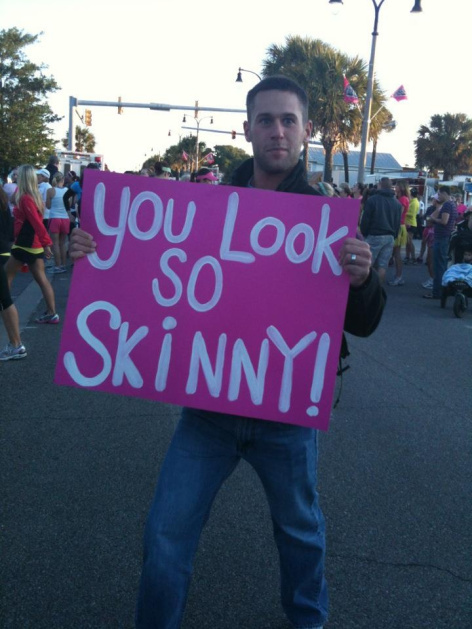 Skinny runners don't use food to make themselves feel better. Of course, they know the importance of using rewards as motivation. And they do reward themselves after reaching an important goal, such as achieving a personal record in a race. But they use non-food rewards, such as a new pair of running shorts, a relaxing sports massage, or pedicure. Non-food rewards have a more lasting positive effect than food rewards because you won't have those feelings of guilt after you've indulged. When you find yourself heading to the fridge or the pantry, ask yourself why you're eating. If it's not because you're hungry, try going for a run or doing another form of exercise instead, even if it's just for 15 minutes. Making a habit of substituting an unhealthy behaviour for a healthy one will make a difference in your weight loss efforts. Make a list of non-food treats that you'd like, so you can refer it to when you're ready to reward yourself for reaching a goal. Keep a food diary and track everything you put in your mouth. Once you start recording all your foods, you'll think more about what you're eating and why you're eating it. Many runners track their foods in their training journals, so they have a record of their workouts and their foods in the same place. Sleep is a critical part of losing weight and maintaining it. It's especially important to runners because of the demands that we put on our bodies. When you're tired, you're more likely to get stressed and give into temptation to eat unhealthy foods. You also may not have the energy to exercise and prepare healthy meals. Aim for 7-8 quality hours of sleep a night -- the right amount for most adults. If that is very far off from your current amount of sleep, try to increase your sleep time in small increments. Try to get 20 minutes more a night one week, and then keep adding ten more minutes each week until you reach the recommended amount. Establish a relaxing bedtime routine, such as taking a warm bath and then reading a book or listening to soothing music. Try not to run too close to bedtime. Although regular exercise does help you sleep better, it's ideal to complete your workout at least a few hours before bedtime. You shouldn't go to bed hungry, but try to avoid heavy meals before bedtime. A full belly can keep you awake. Finish eating 2-3 hours before you hit the hay.